I was raised in a family that enjoyed all aspects of dogs. As a child my parents were Yorkshire Terrier breeders. Through that experience I learned how to take care of newborn puppies, making sure they were always clean and well-taken care of. I helped with the housebreaking and feeding schedules and the training of puppies to ensure that they are well-behaved around the home. That experience has taught me the appreciation of dogs and how to be a wonderful caregiver. 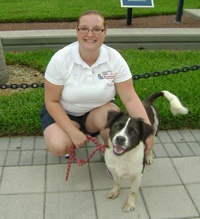 I have been involved with All American Dog Training Academy for over 10 years and married to Dave for 15 years. I can help you with any concern that you may have when you call. I have a passion for dogs and the joy that it brings me and my family. Let All American Dog Training Academy bring you that same joy with a well-trained pet.